The cover of Locke and Key. Clockworks #2, with art by Gabriel Rodriguez, published by IDW. 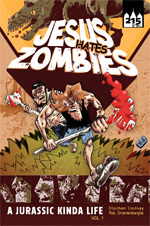 And once more it befalls writer Joe Hill and artist Gabriel Rodriguez that their comic is my book of the week (just like seven weeks ago, and ten weeks ago). It’s really easy to make this my pick again, however it’s pretty hard to write something new about this series (since I already wrote about how great this book looks and how wonderful it reads twice already). If you haven’t read anything of this series, I think you could pick up this issue and enjoy it. But if you don’t read the previous four volumes you’re really doing yourself a disservice. To shortly pitch this series to new readers: it’s about the three Locke kids who live in Key house, in the town of Lovecraft (Massachusetts), with their mother and uncle. Throughout Key house, there lay hidden a hundred different keys, with diverse magical properties (one to open heads, one to open a portal which turns you into a ghost, one which turns you into a giant, one which turns you into an animal etc…). One of the keys has the power to end the world as we know it (the Omega key) and that is the key that the main bad guy Lucas ‘Dodge’ Caravaggio is after. Dodge has gotten his hands on a couple of the keys and doesn’t shy away from using lethal force to get what he’s after. Another beautiful splash page by Gabriel Rodriguez, from IDW's Locke and Key. Clockworks #2. The latest issue of Locke and Key. Clockworks, picks up the story again, after the events of the last volume (Keys to the Kingdom) and a little bit of (much appreciated) background information got to us in the last issue. While the Locke kids think that the bad guy is dead, he’s actually closer to them than ever, and well away to achieving his nefarious goals. The inside of Tyler Locke's mind, as drawn by Gabriel Rodriguez. 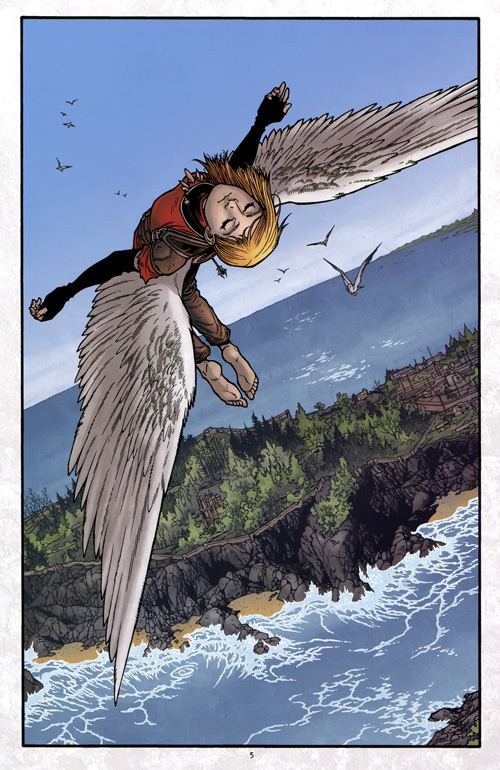 From Locke and Key. Clockworks #2, published by IDW. 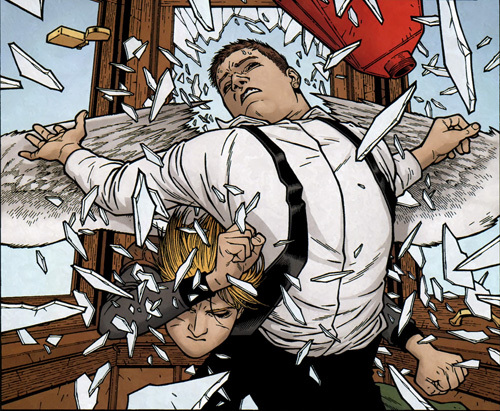 Really, have you ever seen any better shattering glass in the pages of a comic? 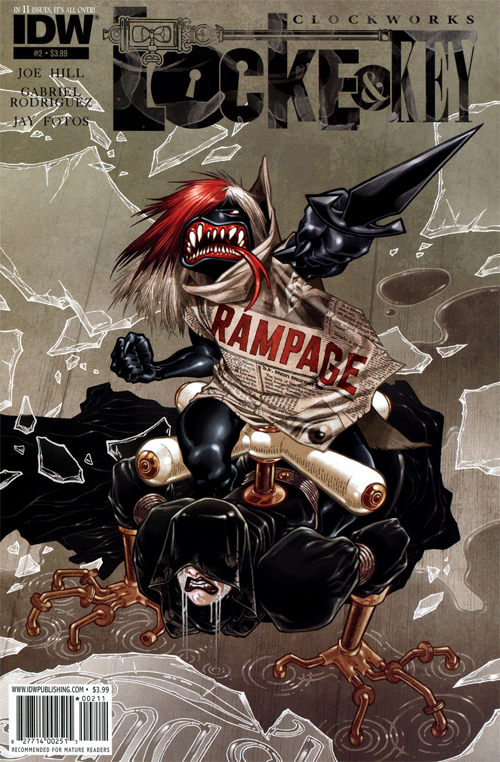 Art by Gabriel Rodriguez, from IDW publishing's Locke and Key. Clockworks #2. Oh, and did I mention that Tyler and Kinsey find a new key at the end of this issue? I’m guessing it’s the Time key or the Clockwork key or some such, as there’s an hourglass on it. I can hardly wait to find out what it does. The theme of the my comic book reading this week was the number one. 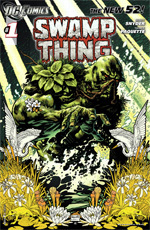 Besides a one-shot and a few books that did not fit in theme, I read ten number one issues. Let’s just say it’s a good warming up for DC’s September reboot. I’m really glad with my selection of books this week, many high scores and even a solid 10 in Severed #1. Also I’m delighted with the selection of different publishers books I’ve sampled this week, ranging from IDW, Dynamite, DC, Image, Abstract Studio, Marvel to SLG. 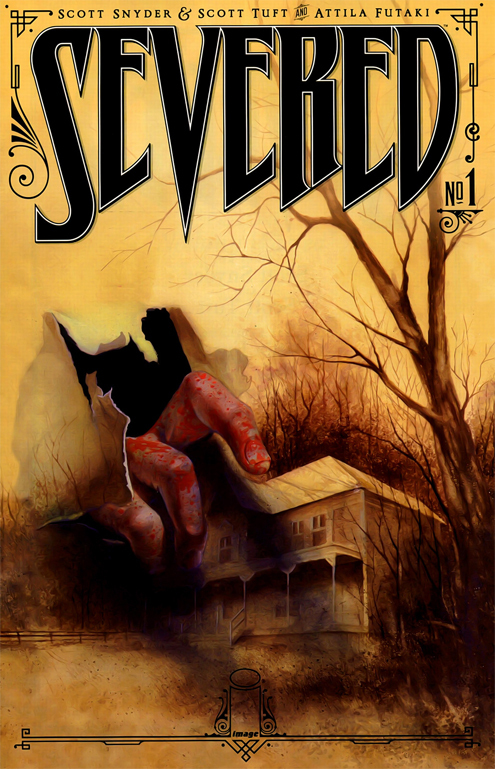 The cover to Severed #1, with art by Attila Futaki, published by Image comics. I had not heard anything about this title before hand and went in without any expectations (except for expecting Scott Snyder to deliver one hell of a story). It was while looking at the cover though, that I first started to fall in love with this book. The cover explicitly channels the look of the eighties horror movie posters I’ve grown up with. Furthermore, a great design element on the cover is the use of the art nouveau-ish decorative borders (coincidentally also used in the Snyder co-plotted Batman: Gates of Gotham miniseries), which even incorporate the logo of Image comics. The first thing that struck me, when I opened the book, was the color. The first scene is a flash-forward, (technically the rest of the book is a flashback, but whatever…) set in or around the nineteen sixties, which is most apparent (besides the television performance of Elvis and the distinctive furniture) by the orange hue of the living room wallpaper. In the following flashback, which takes place in 1916, the scenes all have their own color palate, which doesn’t pop off the page as does the first sequence, but are still very vibrant and dashing to look at. Popping colors by Attilla Futaki, from Severed #1, published by Image comics. The second thing that stood out to me where the pencils, I’ve never seen the work of artist Attila Futaki before, and I’ve never seen anything like it. In fact, the art felt so new to me, that I had to warm up to it a few pages before I started loving it. I’d say it’s a bit painterly, yet has a very classic aesthetic which harkens back to the more detailed and loose art styles that could be found in old EC comics. As it turns out Futaki is a Hungarian artist, who has recently been awarded the Hungarian Zorad Erno award for best artist of 2010. Judging by the art in this issue, that prize was well deserved. It’s a really unique style and perfect to set the mood for this horror series. Here's Jack, waiting to get on the train to begin his Hobo life. 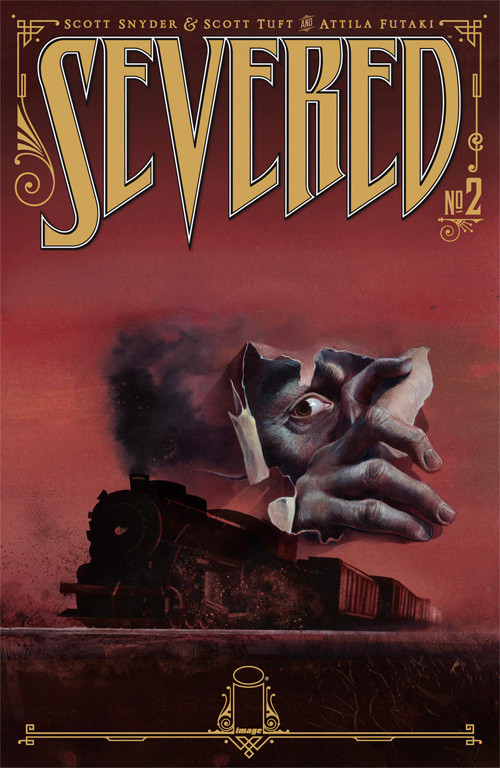 Art from Severed #1, by AttillaFutaki, published by Image comics. Writing-wise the first sequence, set in the sixties, is used as a rather cliché framing device to set the story up. However, since this story seems to be steeped in eighties horror movies, certain clichés are just part of the territory and in that context work like a charm. In the first few pages of the flashback we get to know Jack, a talented violin player in his early teens, who after a heartfelt and good-humored bedtime conversation with his mother runs off into the night to live the life of a hobo. “See the country… Play the streets for nickels…” He wants to walk in the minstrel footsteps of his father. Things almost immediately go haywire. But at least he meets up with some hobo’s who may or may not be helping him out. We also get introduced to Fredrick who is taken out of an orphanage by one mister Porter, who is likely to be the villain throughout this series. And what a classic villain he is. Porter is introduced as working for General Electric and Frederick has been selected for an apprenticeship at his company. In the car the boy and Mr. Porter talk about business. 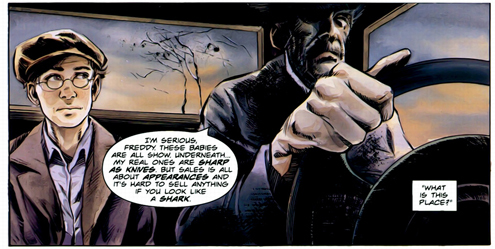 When the boy asks about Porter’s rough way of dealing with things, the man says with a grin: “Behind these pearly whites, I got razor sharp teeth.” When the boy laughs at this reply, Porter continues straight-faced: “I’m serious, Freddy. These babies are all show. Underneath… My real ones are sharp as knives. But sales is all about appearances and it’s hard to sell anything if you look like a shark.” This moment had me laughing out loud, because of the absurdity of the dialogue, yet it provides a horrible feeling of foreboding. This sequence stands as a good example of how the writing of the team of Scott Snyder and his newcomer, childhood friend Scott Tuft works. It hits on all the right notes; a little humor; a little drama’ some emotion; excitement; and a lot of ominous subtext. Apparantly Mr. Porter really has sharp teeth. Great writing from Snyder and Tuft, from Severed #1, published by Image comics. After reading I concluded that this may very well be one of those special cases where a comic book is actually crafted and executed perfectly. The first issue of Severed is genuinely creepy, funny, moving and as intriguing as should be expected from a first issue. Wow. For those that have been reading this blog from the start it’s already obvious what a big fan of IDW’s Locke and Key series I am. For all the others, let me try to explain the genius of this wholly original series by writer Joe Hill and artist Gabriel Rodriguez (warning this part contains mild SPOILERS concerning the plot of the first 24 issues): Over the span of four six-issue miniseries the reader learns to know the Locke family, consisting of teenagers Tyler and Kinsey, their inquisitive little brother Bode and their mother. 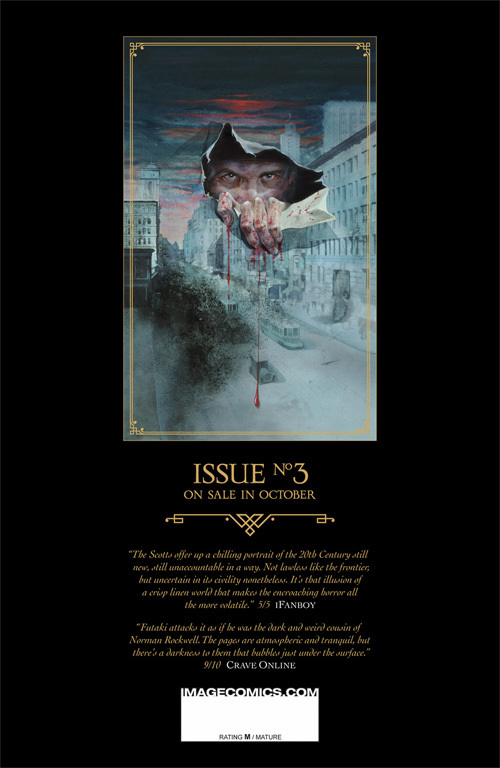 In the first issue of the initial mini-series (Welcome to Lovecraft) the father gets murdered, after which the kids and their mom relocate to the town of Lovecraft, Massachusetts, to inhibit the family estate Keyhouse. In this first series we get to know the characters a bit, for example we learn about brooding teenager Tyler’s guilt about his father’s death. This introduction to the characters however, forms the backdrop of young Bode finding a dark spirit-like ‘echo’ in the well house and ends with him being forced to release this being. Throughout the series we learn about the existence of strange and mysterious keys with magical properties that are hidden throughout Keyhouse. Bode keeps finding these keys and experiments with them. Throughout the course of the series, his older siblings learn about the existence of the keys and use them to their own advantage, as well as to fight the dark force that has been released from the well house. This being is looking for one key in particular, namely the ‘black key’ and does not shy away from killing anyone that gets in his way. While this alone would be enough to produce one hell of a story, the book is elevated even more by the way Joe Hill portrays the characters through believable dialogues and realistic interactions, that make the characters get under your skin. Like the greatest works of fiction, this is not only a book about horror and magic, but more so about emotional interactions. This issue takes place around Keyhouse in the year 1775. All the characters are new and this initially leads to some confusion about what is going on. We get introduced to some forefathers of the twentieth century Lockes, some familiar locations are visited and a whole lot of explaining gets done. For starters we learn the significance of the drowning cave and the hydraulic pumps, but most importantly we learn the origin of the magical keys. On the writing side, this issue is pretty wordy and I found the first half a bit hard to get trough. The second half however kept me turning page after page, while an unsettling feeling settled in my gut and my heartbeat steadily rose. Not only do major plot points get some background, also the link to the works of H.P Lovecraft gets made very explicit. Not only do we get a reference to the fabled icy desert plateau of Leng, we even get some chanting of Lovecraft’s language of the Old Ones: ‘Ia! Ia shubniggarauth!’. While this issue left the cliffhanger of the previous volume dangling, it delivered a whole new dimension of terror to the story. 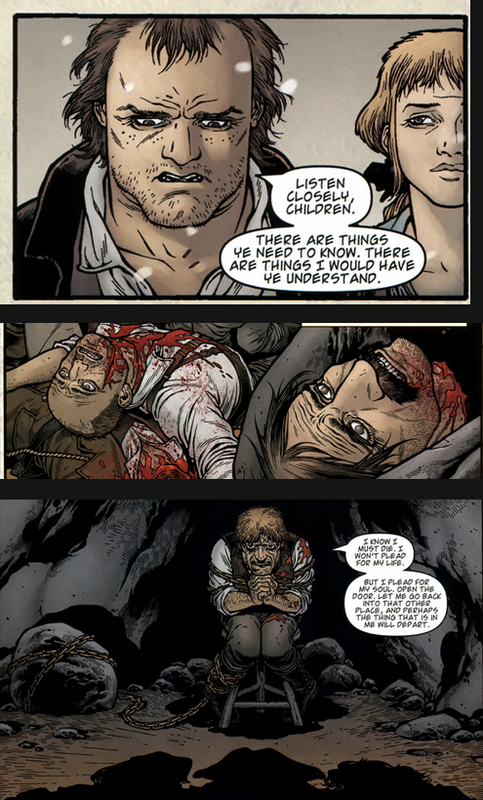 Three random (parts of) panels from Locke and Key. Clockworks 1, with art by Gabriel Rodriguez. Do you see the Dillon (upper), Allred (middle) and Corben (lower)? Or is it just me? Art wise, things were beautiful as always. I find it hard to describe Rodriguez’ style, but this issue I thought I recognized a bit of Steve Dillon in the earlier pages, a hint of Mike Allred in one of the splash pages and further on a dash of Richard Corbin. I’m not saying Rodriguez is aping these artists! These are just little bits of resemblances I see here and there. 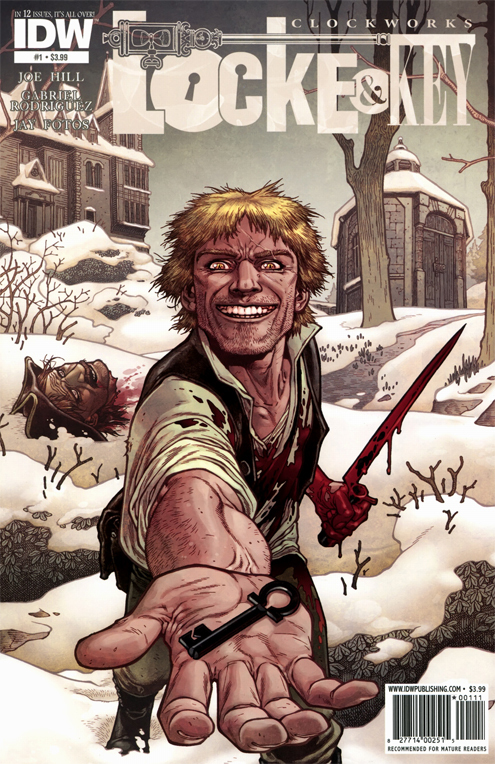 All in all a great start to this fifth volume of Locke and Key. Seriously go and buy it!